In 1989, while attempting to extract precious minerals from his property, a wealthy Arizonan obtained a mysterious white material that initially defied scientific attempts to identify it. After several years of testing, this substance was revealed to consist of gold and platinum--but in a form unknown to modern science. Further research showed that this powder, which had also been discovered to possess marvelous healing powers, contained monatomic forms of precious metals whose electron units had been altered to no longer display the physical, chemical, or electrical properties of the original elements. 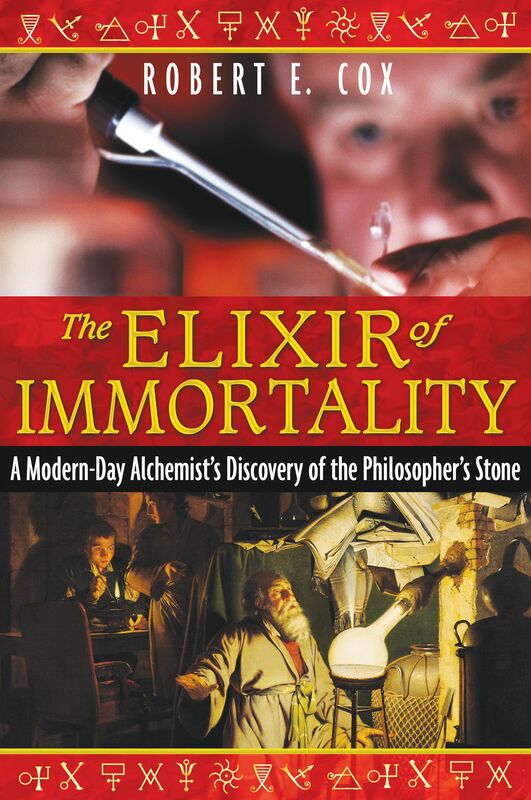 This substance, Robert Cox shows, bears eerie resemblance to the ultimate quest of the alchemists: the elixir of immortality. With respect to ingesting the elixir, the European alchemists were very wary. They report that many practitioners died in the process of trying to ingest the elixir--either because their elixir was false and thus poisonous, or because they took too much and died because of its enormous transformational power. The prescribed dose was to take a tiny grain of the stone and dissolve it in alcohol or water so that the liquid attains a red color, resembling red wine. Then one should take a drop of this liquor and place it in another jug of water or alcohol, which will be less red. This process should be continued until the liquid obtains a golden color. This was called “potable gold.” In one passage it is said that one should take a few drops of this golden liquor every few months to maintain perfect health and freedom from disease. Philalethes describes the powerful effect of the elixir as though it were a veritable fountain of youth. A man or woman who is born to hereditary weakness, may be changed into a more than ordinary strength by the use of our Medicine; or a man who by labor, sickness, and years, is come to Grave’s mouth, even to drop in it, may by use hereof be restored his hair, his teeth, and his strength, so that he shall be of greater agility than in his youth, and of greater strength, and may live many years, provided the period of the Almighties decree be not come. In addition to consuming the elixir, the European alchemists claimed that it could also be used to transmute base metals into gold. To accomplish this, one first has to prepare a red gold glass, by fusing the red elixir with pure gold in a furnace. Below are Flammel’s instructions for this process, recorded in his Breviary. Here is this procedure. Melt in a crucible 10 ounces of fine gold and throw in it, on the melted gold, one ounce of the red powder. Leave it in a very strong fire for two hours, remove the crucible, let it cool, break it, and you will see in the bottom a red glass, that is the exalted gold, true and royal powder capable of transmuting all metals into pure gold, better than the one found in the mines . . . The instructions then direct the practitioner to grind the red gold glass into a powder, called the projection powder, and store it in a sealed vessel. When one desires to make gold from lead or mercury, one should then heat the lead until it becomes molten, or in the case of mercury, until it begins to fume, and then throw in the projection powder of red gold glass wrapped up in a ball of wax. Flammel claims that five or six grains of the projection powder will transmute thirty or forty pounds of lead or mercury into the finest gold. However, he also claims that depending upon how many cycles of multiplication the elixir has been put through its ability to transmute the metals may increase dramatically. In one passage, he claims that thricemultiplied elixir has the potential to transmute approximately 100,000 times its weight of base metals into pure gold. As an interesting side note, he claims that the gold obtained through this method will actually weigh slightly less than the mercury or lead that one starts with. As discussed previously, it is a scientific fact is that both mercury and lead can be transmuted into pure gold. But according to modern science, this can only be accomplished through a high-energy process of nuclear fission, involving the release of alpha particles (nucleons). Because both mercury and lead have a higher atomic number than gold, if one were to start with a certain quantity of lead or mercury and transmute the entire mass into gold (through a process of nuclear fission), then the gold obtained would necessarily weigh slightly less than the original mercury or lead due to the emission of alpha particles--exactly as claimed by Flammel. The problem is that Flammel lived in the fourteenth century, when nuclear physics was completely unknown. Is it possible that the projection powder somehow catalyzed a low-energy process of nuclear fission in the mercury or lead, thus transmuting the base metal into pure gold? With respect to the actual production of the elixir or stone, there is a great deal of confusion, which revolves around similarities between the starting materials and the final products of the process. Virtually all of the European alchemists agreed that one of the starting materials is a specially prepared form of metallic mercury, called philosophic mercury. The other starting material was a specially prepared form of gold called our gold or philosophic gold. As discussed earlier, our gold consisted of finely divided forms of gold (monatomic and diatomic), which no longer display the physical, chemical, or electrical properties of bulk yellow gold. Rather these two forms of gold appear as a white and red powder, called the white and red sulfur. They were compared to “sulfurs” because they have the potential to congeal the liquid mercury, like ordinary sulfur. But they were not the chemical element that we know as sulfur. They were specially prepared forms of pure gold, different from ordinary metallic yellow gold. "The final section of Cox's book reveals what he asserts is the final alchemical secret, which can lead us to a new era of enlightened immortality or a hellish self-created doom. His trust that now is the time and we are the people who are ready to actualize the higher of these two potential destinies is his stated reason for abandoning past cautions and bringing the unvarnished truth into the public arena." "A fascinating study that removes the veils of a closely guarded secret through the ages."